Versio "Vmos" won 1st class with points 100/100. Result was 3rd so Vmos has now also RTK1-title. Tyyppi "Voitto" won class 3 in Obedience with 1st price, points 259,5/320. Soturi "Bolt" won twice with 0-course in Agility. Tyyppi "Voitto" won class 3 in Obedience with 1st price, points 275,5/320. U- and V-litters are now 3-year-old. Versio "Vmos" won class 3 in obedience with 2nd price with points 253/320. Happy birthday to all U- and V-puppies! Congratulations for nice result Heidi and Vmos! Raven made IP3 with points: tracking 90, obedience 88 and bite work 80, together 258/300. Versio "Vmos" made result in class 1 in Rally-obedience with points 96/100. Congratulations Andreas and Raven, Heidi and Vmos! Tyyppi "Voitto" made 0-course (jump) in Agility class 1, placement 4th. Sinko, Vintage and Vip have still unaffected eyes. Thanks for your activity Sari! Uligaani "Cuje" won with 0-course (jump) in Agility class 2. Vip made 5-course in Agility class 1, placement 3rd. Starbuck made nice result in Mondioring CAT1: 171/200p. Ulivili "Manu" made IP1 with II-result: tracking: 88/100, obedience 89/100, bite: 78/100, together: 255/300. Uutinen "Uppis" made IP1 with II-result: tracking: 96/100, obedience 75/100, bite: 87/100, together: 258/300. Talismaani "Juju" made HK1 with I-result: obedience: 94/100 search 170/170, object search 30/30, together: 294/300. Congratulations Sari and Manu, Anna and Uppis, Minna and Juju! Uligaani "Cuje" made with I-result: obedience 98/100, tracking and object search 198/200, together 296/300. Sinko "Ruuti" won tracking competition with I-result: obedience 90/100, tracking and object search 199/200, together 289/300. Talismaani "Juju" made II-result in Obedience class 4 with points 239,5/320, placement 1st. Quti "Nomi" made 3rd result in Rally-obedience class 2 and got title RTK2 with points 86/100. Placement 4th. Uligaani "Cuje" made two 0-courses in Agility class 2, placemenst 1st and 2nd. Congratulations Sari and Ruuti, Minna and Juju, Noora and Nomi, Tanja and Cuje! Tyyppi "Voitto" got title JK2 in tracking: obedience 89/100, tracking and object search 177/200, Together 266/300. Quti "Nomi" made II-result in obedience class 4 in race championships, points 256/320. Placement 7/9. Quti "Nomi" won race championships in Rally-obedience in class 2 with points 88/100. 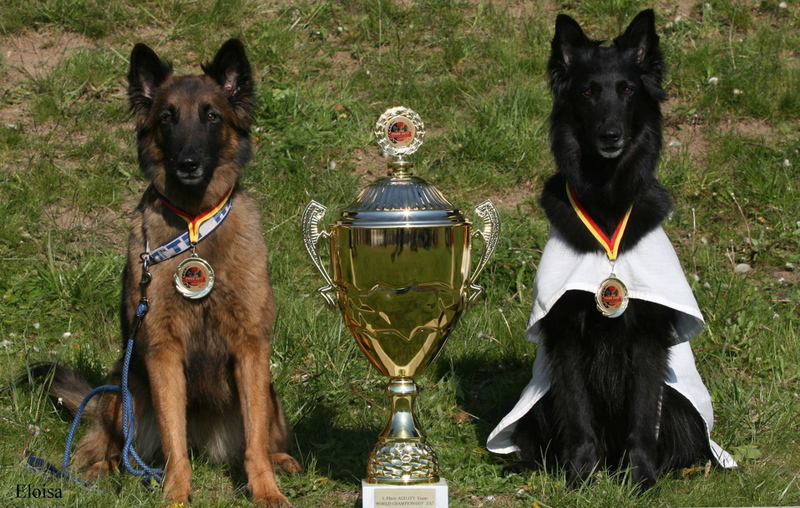 Versio "Vmos" made result in Rally-obedience race championships with points 93/100, placements 6/9. Vmos was also a member of the team, which won silver. Congratulations Anne and Voitto, Noora and Nomi, Heidi and Vmos! Versio "Vmos" got title EK1: obedience 71/100, tracking and different search works 150/200, together 221/300. Vekki made I-result in water rescue class 1 with points 99/100. Ruska "Kitty" made three 0-courses in Agility race championships and won silver medal. Placements 2nd, 3rd and 4th. Soturi "Bolt" made 0-course (jump) in Agility, placement 2nd. Persoona "Ansa" made 0-course (jump) in Agility, placement 5th. Uligaani "Cuje" won with 0-course in Agility class 1 and now competes in class 2. Eloisa Agility -team won Race championships! Team members were: Tanja, Persoona and Uligaani, Marko and Ruska, Antti and Soturi. Congratulations Heidi and Vmos, Nina and Vekki, Marko and Kitty, Antti and Bolt, Tanja, Ansa and Cuje! 10.9. - Vekki made I-result in Water rescue in class 1 with points 95/100. 9.9. - Vekki passed working test in Water rescue with points 100/100. 3.9. - Tyyppi "Voitto" won with 5-course in Agility class 1. 2.9. - Soturi "Bolt" is Champion in district of Pohjois-Savo in Agility. Congratulations Nina and Vekki, Anne and Voitto, Antti and Bolt! tracking and object search 195/200, together 272/300. Persoona "Ansa" made 0-course, placement 4th. Ruska "Kitty" made 0-course, placement 3rd. Soturi "Bolt" made 0- and 5-courses, placements 2nd and 3rd. Uligaani "Cuje" won in class 1 with 0-course (jump) and 5-course (Agility). Congratulations Tanja, Ansa and Cuje, Marko and Kitty, Antti and Bolt! Persoona "Ansa" made I-result: obedience 90,5/100, tracking and object search 180/200, together 270,5/300, placement 9/46. Ralli made II-result: obedience 85,5/100, tracking and object search 169/200, together 254,5/300, placement 13/46. Quti "Nomi" karsiutui, eik� valitettavasti p��ssyt maastoon. Ruska "Kitty" won with 0-course in Agility. Congratulations Tanja and Ansa, Marko and Kitty! Uroteko "Karpo": eyes, knees and heart health. Quti "Nomi" won Rally-obedinece in class 1 with points 86/100. THANKS for your activity Mari! Persoona "Ansa" made 0-course, placement 5th. Soturi "Bolt" made 0-course, placement 4th. Uligaani "Cuje" made 5-course in class 1, placement 2nd. Versio "Vmos" won with 0-course (jump) in class 1. Roihu got 25 point in character test. Congratulations Tanja, Ansa and Cuje, Antti and Bolt, Heidi and Vmos! Thanks for your activity Laura! tracking and object search 160/200, together 236/300. Ruska "Kitty" in qualifying of Agility World Champion -competition, placement 16/42. Soturi "Bolt" in qualifying of Agility World Champion -competition 28/42. Vip made I-result in Obedience class 1 with points 172,5/200p. Pimu "Miina" got title RTK4 in Rally-obedience competition with points 80/1010. Congratulations Marko and Kitty, Antti and Bolt, Sari and Vip, Sannamari and Miina! tracking and object search 180/200, together 259/300. Ruska "Kitty's" placement was 9th with 5-result. Versio "Vmos" got title JK2 with II-result: obedience 78/100, tracking and object search 179/200, together 257/300p. Uroteko "Karpo" got title HK1 with II-result: obedience 74/100, search and object search 191/200, together 265/300. Uutisen "Uppis" has health back. Heidi and Vmos, Mari and Karpo! Thanks for your activity Anna! Uligaani "Cuje" won with 0-course (jump) in class 1. Soturi "Bolt" has health eyes. Ulivili "Manu" has health eyes and heart. Knees are 0/0. Congratulations Tanja and Cuje! Thanks for activity Tanja, Antti and Sari! Persoona "Ansa" made 0-course, placement 3rd. Ruska "Kitty" made 0-course, placement 2nd. Quti "Nomi" class 4, points 188/320, no result. Tyyppi "Voitto" 3rd 1-result in class 2 with points 273/320, placement 20/71 and title TK2. Ulivili "Manu" 1-result in class 2 with points 263/320, placement 28/71. Uligaani "Cuje" 1-result in class 1 with points 177,17/200, placement 31/73. Congratulations Noora and Nomi, Anne and Voitto, Sari and Manu, Tanja and Cuje! tracking and object search 172/200, together 253/300. Soturi "Bolt" won twice with 0-courses in Aglity. Congratulations Heidi and Vmos, Antti and Bolt! Ruska "Kitty" made two 0-courses, placements 1st and 2nd. Ruska and Persoona were members in Finnish Agility team, which won team World Championships! Soturi "Bolt" got place into finals, but unfortynately disqualified. 10.5. - Ulivili "Manu" and Uligaani "Cuje" passed BH-test. 7.5. - Roihu made 0-course in Agility, placement 4th. 29.4. - Uutinen "Uppis" passed BH-test. Ulivili "Manu" made 1-result in obedience in class 2 with points 290,5/320, placements 3rd. 14.4. - Soturi "Bolt" made two 0-courses in Agilityss�, placements 2nd. Andreas and Raven, Anna and Uutinen "Uppis", Sari and Ulivili "Manu", Laura and Roihu. Qelmi has still unaffected eyes. Health is OK and knees 0/0. Silhuetti made 0-course, placement 2nd and first J-CAC. Tyyppi won Obedience class 2 with 1st prize, points 294/320. Congratulations Salome and Silhuetti "Noxy", Anne and Tyyppi "Voitto"! Soturi made 0-course, placement 3rd. Uligaani made 5-course in class 1, placement 3rd. Congratulations Antti and Soturi "Bolt", Tanja and Uligaani "Cuje"! Quti made 3rd result in beginner class with points 100/100, placement 2nd. Congratulations Noora and Quti "Nomi"! Quti made 3rd 1st prize in Obedience in class 4 with points 264,5/320. So Quti is now Finnish Obedience champion, FI OCh! Quti made result in beginner class with points 97/100, placement 3rd. Ruska was 2nd with 0-course. Congratulations for double victory Antti and Soturi "Bolt", Marko and Ruska "Kitty! Tyyppi won Agility jump-course in class 1 with 5-result. Uligaani won agility-course in class 1 with 0-result. Congratulations Anna, Anne and Tyyppi "Voitto", Tanja and Uligaani "Cuje"! 18.2. Quti in Obedience- , Kitty and Bolt in Agility-competitions. Quti made 1st price in Obedience class 4 with points 283/320, placement 2nd. Ruska and Soturi made 0- and 5-courses in Agility EO-qualification. Uroteko got quality "Good" from dog show. Congratulations Noora and Quti "Nomi", Marko and Ruska "Kitty", Antti and Soturi "Bolt"! Talismaani has health eyes and knees. Persoona is best working dog 2016 of P-Savo district. Versio is best newcomer 2016 in obedience of Turun K�ytt�koirat. Tanja and Persoona "Ansa", Heidi and Versio "Vmos"! Ruska made 0-course (agility), placement 4th. Congratulations Marko and Ruska "Kitty", Antti and Soturi "Bolt"! Waara made 0-coure, placement 2nd and Agility-CAC. Persoona made two 0-courses (jump and agility), placements 1st and 2nd. Ruska made two 0-courses (jump and agility), placements 3rd and 1st. Soturi made 0-courses (jump and agility), placements 4th and 3rd. Congratulations Tanja and Persoona "Ansa", Marko and Ruska "Kitty", Antti and Soturi "Bolt"! Talismaani won with 1st prize in class 3, points 274/320. Uroteko made 1st prize in class 1, points 192/200. Placement 2nd. Congratulations Minna and Talismaani "Juju", Mari and Uroteko "Karpo"!